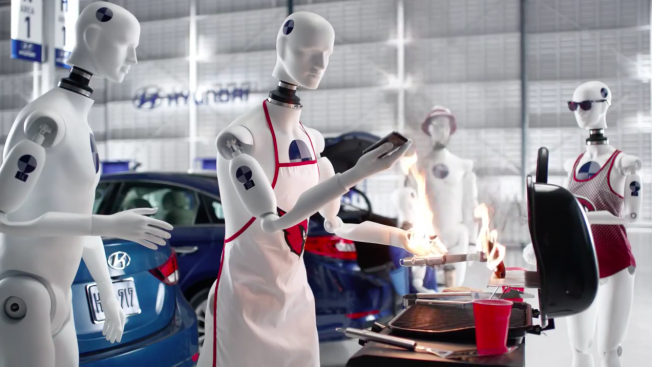 Gary Rome Hyundai Dealer Blog - A Gary Rome Hyundai Site (888) 637-4279: Hyundai Built a Whole Town Full of Careless Crash Test Dummies for Quirky Tucson Ads: Don't try any of this at home. Hyundai Built a Whole Town Full of Careless Crash Test Dummies for Quirky Tucson Ads: Don't try any of this at home. Hyundai's latest commercials for its Tucson SUV are set in a town with a quiet, but incredibly accident-prone, community of inhabitants. That's because they're all crash test dummies. The bizarre but likable ads from Innocean USA actually take place in a minimalist,white-walled warehouse decorated with street signs, lamp posts and plastic shrubbery. The spots show various dummies getting easily distracted in typical driving situations—they are dummies, after all—and the vehicle's features coming to the rescue. "The goal was to create a really memorable and smart series of spots that refreshingly deviate from the standard crash-test-dummy commercial," says Innocean creative director Bob Rayburn. "The trick is that even though our subjects were all dummies, we needed to draw viewers in by their human-inspired, character-driven actions." "One interesting element of the shoot was the fact that we had to fully execute all the safety features in each of the videos—meaning we couldn't edit around the feature working," Rayburn says. "Legally, we had to show it working. Everything had to be triggered naturally, and the car had to respond all on its own. It's human nature to worry when a car is headed for another car and we aren't allowed to hit the brakes. But the car came through, and the automatic emergency braking did its job." All in all, working with flesh-and-blood actors is a breeze compared to coaxing usable performances from a troupe of dummies, Rayburn says. "Having to position them exactly right to get across the notion that they aren't paying attention sounds easier than it actually was," he says. "It felt like we were adjusting some dummy part after every take to get them just right. The fact that we used a hybrid mannequin/crash test dummy helped because we were able to manipulate them physically and position them how we needed." They're also less sensitive than flesh-and-blood actors. "We could yell at them without having to worry about their emotions," Rayburn says. "They absolutely nailed every take." As a competing nameplate recently taught us: Sometimes the best innovations happen when you don't think of dummies as dummies.